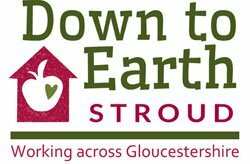 Down to Earth Stroud support people in growing and harvesting their own fruit and vegetables. Our aim is to increase access to, and availability of, fresh, nutritious and healthy food and encourage reconnection with the land. We provide a range of services including gardening and we run several community projects across Gloucestershire. We provide private gardening services and subsidised schemes across Gloucestershire. We are always looking for capable gardeners to join us, preferably with experience in using petrol tools. If you are interested, get in touch!